The Terramar HOA Board nominations are held at the annual meeting each year in June. This year the meeting is June 8th. · Section Directors for Sections 1, 3, 5, and 7. If anyone is interested in running for any of these, please contact one of the ladies below and let them know. · Pool or Marina key? Call or email Janice. Proof of ownership required, driver’s license or utility bill. Note: Unimproved Lot Mowing is an optional service offered by Terramar, you may choose to handle privately instead. Open Memorial Day weekend through Labor Day. Weekends only in May and September. Closed on Tuesdays. Hours: 10:00 A.M. to 7:30 P.M. as light permits. If your gut is telling you to call the police, then you probably should. If you are reluctant to call the police, at least call us at 409 765-3702 (police non-emergency). To make a complaint or contact the Code Enforcement Officer for your area, please contact the Office of Housing and Compliance by calling or send an email to Planning Counter. Parking Control is administered by the Galveston Police Department. Animal Control is administered by the Galveston Police Department. · Traffic Defective signal, damage traffic signs, defective street light. · Street Lights For defective street light, you must enter below the 6-digit number found on the lamp pole. If you have a problem concerning renters at a Terramar property that is rented through realtors who are members of GARM, Galveston Association of Rental Managers, you may call Gulf Coast Security and Services (GCSS) at 409-682-3603. This service is provided by the Galveston Association of Rental Managers. Calls will be answered 7 days a week/24 hours a day. GARM provides an active patrol to the West End 3 week-day nights and on Friday and Saturday nights from 10 PM - 4 AM. During the summer, there is also a Sunday night 10 PM - 4 AM patrol. GCSS will handle minor infractions at rental properties such as loud noise past curfew, too many guests, cars etc. If a crime is in progress, such as a burglary or an assault etc., be sure to call 911. GARM has a GARM Property Managers Code of Conduct for its members. GARM requires its renters to sign a GARM Renters' Agreement. Click to see the new revised Beachfront Construction/ Dune Protection Permit Application revised information as of April 15, 2009. When not using your home for an extended period it is prudent to turn off the water to the home to prevent possible damage in case of a leak or burst pipe. Owners are charged for any water that runs through a water meter, even if there is a leak. To prepare for a tropical storm or hurricane please turn your water off at the meter. In a storm situation where water is left on, the owner would be charged for the water. If there are multiple homes with leaks due to damage, there could be low or no water pressure for all homes. Also in case of a storm please secure your garbage can and other loose object around your home. The following are pictures from Jamaica Beach Corp. and Timewealth Brochures when Terramar was developed - loaned by Frank & Ginger Helfrich. Marina at the end of the Terramar Channel - it was destroyed by a fire in the 1970s. The West Galveston Island Property Owners Association meetings are on the 3rd Saturday of each month at 9:00 A.M. usually at the Galveston Country Club. However the location may vary so please click for time, place, and more information. The Galveston County Office of Emergency Management will add residents to the First Call Alert and Warning System in Galveston County when requested. Click to download the request form, (in PDF format) which is located on the Galveston County OEM website. The information will be utilized when the First Call Alert and Warning System is activated. The City of Galveston is in the process of establishing an Emergency Notification System. Information about the emergency system and registration information is on the city of Galveston website under Register for Emergency. Please keep our soldiers in your thoughts and prayers as they serve to protect us. May God bless them and their families for the selfless acts they perform for us in our time of need. 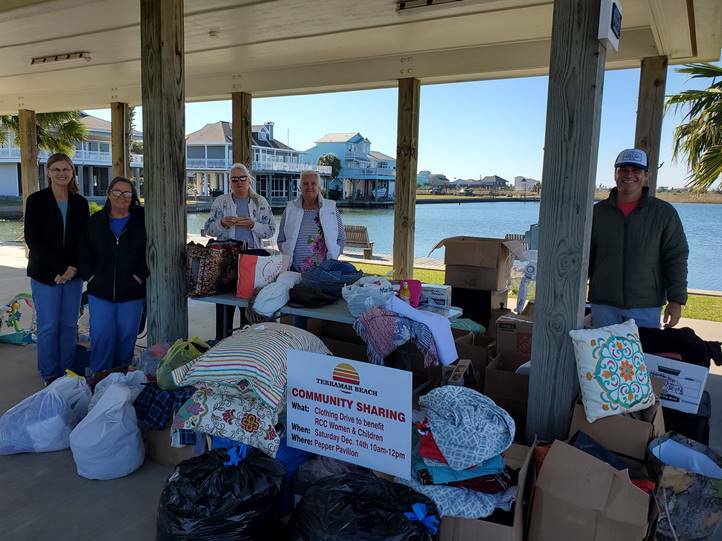 The Board of Directors, their appointees, and volunteers serve Terramar Beach residents. The Terramar Beach Community Improvement association by-laws delegates to the Board the power and responsibility to maintain and improve the community's property and to represent the residents of Terramar Beach. Note: TBCIA Annual Meeting June 2017 approved the following amendment. Article 8 Part 6 Amended expenditure from $10,000 to $15,000. The By-Laws PDF will be updated shortly. The By-Laws have been saved in PDF format, which requires the Adobe Acrobat Plug-In. If your computer doesn't have Adobe Reader, click on the icon to download. Some documents have been saved in PDF format, which requires the Adobe Acrobat Plug-In. If your computer doesn't have the Acrobat Plug-In, click here to download it. Time and location may vary each month, call a board member for details. TBCIA annual meetings are held the second Saturday of June. TBCIA is a member of the West Galveston Island Property Owners Association. Be sure check for the minutes of their monthly meetings. Individuals are welcome to join WGIPOA; information about joining is on their website. Carolyn Farmer is the Terramar Beach representative. The WGIPOA meets the third Saturday of the month at 9:00 A.M. usually at the Galveston Country Club. However the location may vary so please click on www.wgipoa.com for time and place. Questions concerning building permits issued by Terramar should be directed to the Architectural Board. All new construction, renovations to an existing structure, and bulk head repair or replacement of $1000 or more must comply with City of Galveston building codes and with the Terramar Beach Architectural Board REQUIREMENTS TO BUILD. Two copies of plans, a $100 filing fee, and the completed REQUIREMENTS TO BUILD document must be submitted to the Architectural Control Board for approval. A copy of the Terramar Beach REQUIREMENTS TO BUILD may be obtained by contacting any member of the Architectural Control Board or clicking on the Requirements to Build file below. Over 95% of the lots in Terramar Beach are privately owned. At any given time a number of houses and vacant lots are for sale through local real estate agents. Those considering buying or building on the beach front areas should also become familiar with the Texas Open Beaches Act and understand how it affects beach front properties. Terramar Beach has 592 platted lots, with homes built on approximately one third. All the homes are single family dwellings built on pilings. Deed restrictions do not permit commercial development. Please note, section 8 is new (March 2017) and may not be referenced on all maps or documents. *The deed restrictions are copies of the original deed restrictions. The deed restrictions have been saved in PDF format, which requires the Adobe Acrobat Plug-In. If your computer doesn't have the Adobe Acrobat Plug-In, click here to download . Terramar Beach is within the City of Galveston; all Galveston City ordinances apply. Terramar streets are city streets; motor vehicles, including motor cycles, motor scooters, three-wheelers, and golf carts must comply with City of Galveston ordinances. There is a leash law for dogs. The beach on the Gulf side is alcohol free. (Galveston City Ordinance 93-45). Unsupervised children at the pool must be at least 14 years old (Galveston City Ordinance). If you are going to operate your golf cart on a public roadway in the far west end of Galveston, you must register it as prescribed by law. The driver of the golf cart must be a licensed driver. In addition, golf carts are subject to the same prohibitions as regular motor vehicles with regard to areas on the beach where motor vehicles are not allowed. Keys are required for the swimming pool and boat launch. There is a $30 fee for a key. A $30 fee will also be charged for replacement keys. Only property owners may obtain a key. Trash is collected on Monday- Green Carts need to be out before 6:00 A.M. If a Monday is a city holiday, then the Monday Route will be picked up on Tuesday. All garbage needs to be placed in the Green Cart with the lid closed. The empty trashcan should be removed from the street by Tuesday (or the day after pickup). Absolutely NO Building Materials will be picked up. All trash/brush etc. pick-ups need to be next to the trash cans. In case of a storm, secure your Green Cart/trash can as well as any other loose objects around your home. Services are available to put your trash can out and back under your home. If you have any construction materials at all in your garbage can the entire can will be bypassed. In addition, no construction materials will be picked up if they are stacked next to your can. Each resident must haul off any scrap building materials to a dump. Please clean and remove any lumber/building materials, etc. that has been placed on or near your property. Letâ€™s all help keep things nice. The garbage men will not pick up yard debris such as limbs or palm leaves on vacant lots. We are having a problem with residents taking this sort of debris and putting it on the vacant lots across the street or next door to them. It sits there forever and eventually has to be removed by someone before the vacant lot can be mowed. The community bulletin board is for use by Terramar property owners. Below are the requirements for use. Postings may only be made by a Terramar property owner. Postings must be signed by the property owner. Postings must be removed after two weeks. Any postings not meeting the above conditions will be removed. U.S. mail boxes for residents are located near the pool. There are letter sized mail slots for sending mail which may be used by residents and guest. The Galveston - Bob Lyons Station, 5826 Broadway, serves the 77554 zip code. Terramar Beach is a residential and recreational community within the City of Galveston, located approximately 20 miles southwest of downtown. The subdivision extends from the Gulf of Mexico across the island to Galveston Bay. From Houston, take I-45 South to Galveston Island. Turn right onto 61st Street. Follow 61st Street to the Seawall (road alongside the water). Turn right onto Seawall, which becomes FM 3005.